According to an internal study conducted by Yong-Li Zhou, the founder of luxury stem cell skincare brand Enbacci, 7 out of 10 customers who masked on a weekly basis did not properly exfoliate and treat their skin when performing a face mask application. As with other skincare, masks need to be done at the correct time in your routine. For the ingredients in a face mask to work, your skin needs to be prepped. This is to remove any dirt and dead skin from the skin. This helps the skin to properly absorb the active ingredients into the deeper layers of the skin, rather than it sitting on top and only working on what needs to be removed. “When applying a face mask, it’s important for the skin to be cleansed and free from dead skin cells in order for the face to absorb the relevant nutrients,” says Yong-Li. It’s been said in the past that you need to open and close your pores… this is a myth. Pores don’t have the muscles required to open and close. The best we can do is clear the debris so if you’re using a detox mask, it’s able to remove any underlying dirt and bacteria. There are so many masks these days it can be hard to know what to choose. It comes down to what your skin requires. If you have acne prone skin, you’ll be tempted to remove the oil. In actual fact, what you need to remove is bacteria. Oil is needed to keep the skin healthy. For dry skin you obviously need rehydration. Look for hyaluronic acid in the ingredients. It holds 1000 times it’s weight in water. Sensitive skin? You need to avoid things like alcohol, salicylic acid, perfumes and so on. Chamomile, certain Clay’s and cucumber are amazingly soothing. Again, hyaluronic acid is great here. Any sheet mask containing hyaluronic acid or cucumber. This is essential. After stripping your skin with an exfoliant, you need to rebuild the acid mantle. This protects the skin from pollution and the elements. It also locks in the masks active ingredients, helping them absorb into the skin layers better. 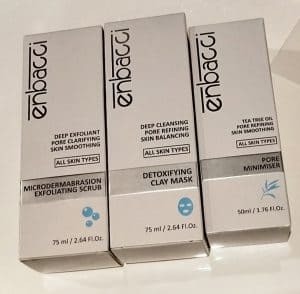 Enbacci is a plant stem cell based skincare brand which makes a huge difference to your skin. I’ve used a range of their products and can’t fault it. It’s also cruelty free and made in Australia. These products are designed for all skin types. Please remember to do a patch test before use though, because every skin reacts differently. I chose not to use the pore minimiser because I’m sensitive to tea tree. Instead I used the Clinique Dramatically Different Hydrating Jelly Anti-pollution.